The Cracker Company HOUSE BLEND - A colourful mix of peanuts and Japanese sushi rice crackers with original Japanese Soy Sauce. Rice, PEANUTS, sugar, WHEAT, SOY SAUCE, salt, vegetable oil, malt syrup, maltodextrin, starch, seaweed, SESAME, tapioca, chilies, coloring: E129 , E150, E110 , E102 , E133, E120, E140, E160b, E160c . May contain traces of NUTS . Can affect activity and attention in children. 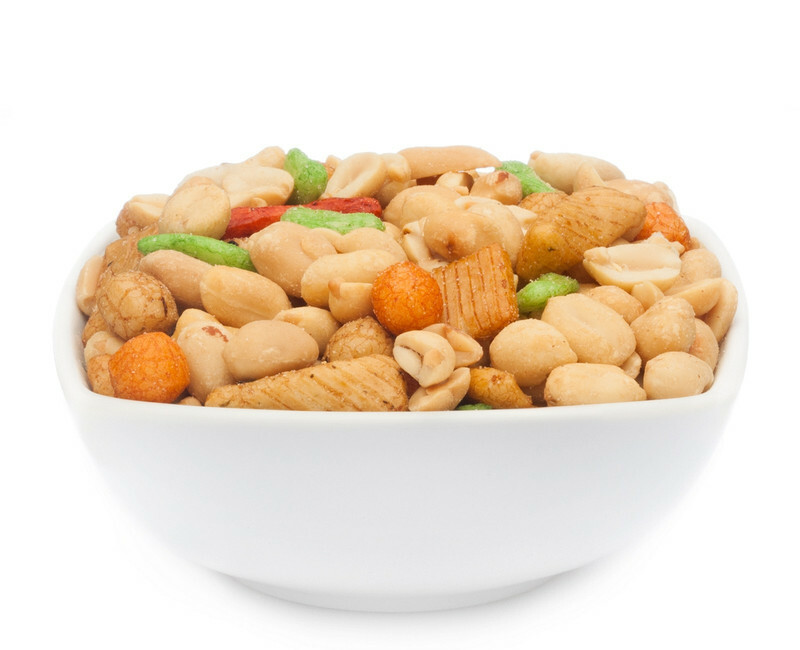 Peanuts have always been known as an important nutrient supplier of vegetable protein and also contain a whole series of minerals and trace elements.The House Blend is, therefore an ideal snack to replenish his depleted energy reserves. Because in addition to the crunchy peanuts, still make our Japanese sushi rice crackers both in taste and colour looks good, our House Blend is a highly refined snack, a unique experience for any occasion. In this special house blend we combine our most popular snack component: crunchy peanuts and refined with original Japanese soy sauce sushi rice cracker.A perfectly tuned mixture: nutty and spicy. Here, no restraint should be exercised. Peanuts are one of the highest protein contents of all nuts. Healthy snacking and great taste are not opposites, but rather a perfectly coordinated snack experience without feeling guilty at our premium House Blend. Our House Blend Mix makes taste and appearance really something here. How and where you can enjoy our favourite house mix?Of course, this is entirely left to you. Traditionally, this blend is offered at numerous internationally renowned bar counters.But traditions can at any time break, isn't it? Take the House Blend some times in the summer with the quarry. The summers heat is more bearable immediately if you enjoya handful of these tasty peanut rice crackers combined with a cold beer or a cold green iced-tea. So a relaxing day with your friends nothing prevents.Or you love the cold season? Skiing with friends, in the evening during the Apre-ski with a mug of mulled wine or punch? Again, our favourite blend is always a welcome companion, because with the House Blend you're always in a good mood. Whether in the ski pants or bikini!